Yeah, we made it to Hong Kong before the 'hand-over'. Unfortunately, it rained most of the time we were there. My main impression of Hong Kong was that it is China, with many (way too many, actually) trendy stores. We did the usual tourist stuff. We saw the Peak, in the rain (The Peak Cafe is great, make sure to stop there). We walked through the antique shops of Hollywood Road, in the rain. 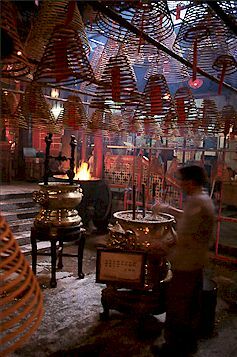 We saw Man Mo Temple in the rain. We went to the Hong Kong Cultural Center in the rain. We went to the Jade Market in the rain. And, we went to Kowloon Park in the rain. It was surprising that there were so many people out in the rain, shopping, eating, and wandering. I come from New York, where we spell Weather with a capital 'W' (rain, heat, cold, snow, blizzards, sleet, hail, lightning, and more). Eskimos have 100 words for snow. New Yorkers have 200 words for 'inclement' (most of them unprintable). If we stayed indoors every time there was bad weather, we'd never get out. However, the rain in Hong Kong was powerful, wild, and never-ending. It was just plain depressing. If I hadn't spent money to be here, I'd have been sitting on a sofa, with one hand holding a glass of Malibu and the other hand on Angie's leg. But the Honkies were shopping and eating their brains out. Was this a desperate binge before the Chinese take-over? Or normal operating mode? Chinese Junk Well, on a walk through the neighborhoods, I think I found my answer. It appears that there is only one thing worse than being stuck out in the Hong Kong rain. That would be staying inside a Hong Kong apartment. They look terribly small and run-down. Maybe Hong Kongers have 200 words for 'cabin fever'. 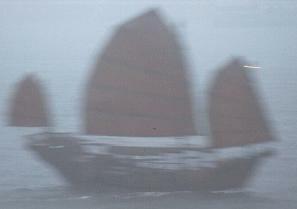 From the Cultural Center (in the rain, of course), we spotted this Chinese Junk. The view was so dark and misty, that I almost didn't take the picture. After the picture came back, I decided I should use it as a metaphor for the passing of Hong Kong to the Chinese. Drifting through the mist, not sure where the future will take it, etc., etc. 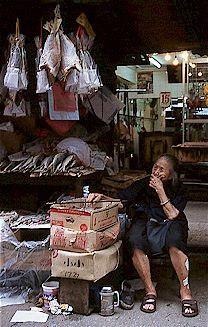 But the truth is, after visiting Hong Kong, I felt perfectly comfortable with it returning to China (easy for me to say, huh?). I understand the political issues, but come on, anyone who's been in this city/state for more than five minutes can tell it belongs more with China than Britain. Not that it's better there, just that it belongs there. When it finally stopped raining, I went to a market near the hotel and took some pictures. So, you tell me: China, or Britain?